Anthony has lived in Adelaide since 1999. 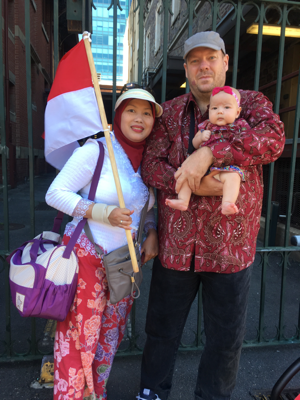 He married Murti in 2008 in Depok, Indonesia and they have a daughter, Yasmin, born in Adelaide in 2016. Anthony and Murti have been members of the Australian-Indonesian Association (AIA) of South Australia Inc. for many years and have both served on the Committee. Anthony is the current Secretary and Membership Officer of the AIASA Inc. Anthony and Murti travel to Indonesia at least once per year, with Yasmin’s first trip in 2017. Most of their time in Indonesia is spent with family in Depok (and Jakarta) but they have also travelled to Yogyakarta, Solo, Pandeglang, Purwokerto, Bandung, Denpasar and Ubud. Anthony works for the Commonwealth of Australia as a Research Scientist focusing on software and simulation technologies. Anthony completed a PhD in Computer Science at the University of Adelaide in 2009 and was the recipient of a Fellowship in 2014 to conduct simulation research with the Netherlands Organisation for Applied Scientific Research (TNO) in Den Haag (The Hague) for 12 months. Anthony completed his undergraduate studies with the University of Newcastle in New South Wales receiving Bachelor degrees in Computer Engineering (with First Class Honours) and Computer Science. Anthony has more than 20 publications in journals, conferences, and other fora including best paper awards. Anthony is a native speaker of English and has some understanding of Indonesian. In addition to his full time employment, Anthony provides research services to post graduate students in the form of editing, proof reading and custom software development.